Over the first weekend of May, BGR team members held their annual general meeting on Saturday, May 3rd, followed the next day by a board meeting which focused on the selection of projects for our next fiscal year, which runs from July 1st, 2014 through June 30th, 2015. Both meetings took place at Chuang Yen Monastery, headquarters of the Buddhist Association of the United States. Team members came from across the US, even from such distant states as California, Colorado, Florida, Illinois, Massachusetts, Pennsylvania, and Texas. At the board meeting on May 4th, the board approved twenty-three projects for partnership grants in the next fiscal year, at a total cost of $348,250. This marked a 22 percent increase over the $285,000 allocated at the previous year’s project meeting. Several projects are renewals of those that have already proved their worth, while others are new undertakings with partners both new and old. Projects approved include several multiyear programs, which increased support for BGR has now made feasible. Experience has taught us that programs extending over several years allow for the pursuit of bolder goals than is possible with one-year projects. This is the first of a six-part series of posts giving brief summaries of the BGR projects approved at the meeting. Projects are arranged alphabetically by country. International projects precede the U.S. projects, which will be described in the final post. Thanks are due to Patti Price, chair of the Projects Committee, along with Jessie Benjamin, David Liu, Carla Prater, and Jennifer Russ, who all helped prepare the material used in this series. Helen Keller International, established in 1915, works in 22 countries to save the sight and lives of the most vulnerable and disadvantaged people through programs in vision, health, and nutrition. 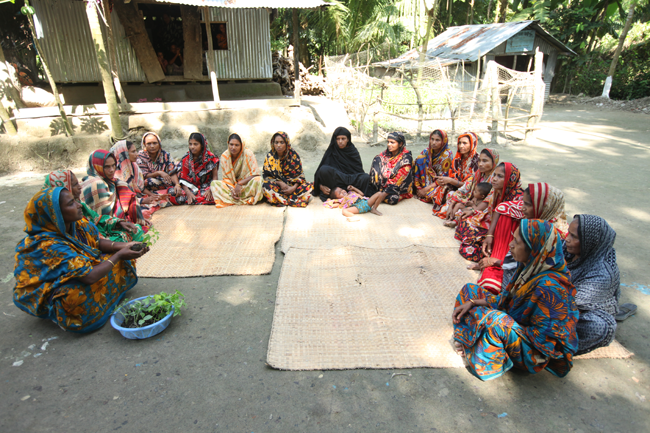 Starting in July, BGR will enter the second year of a three-year partnership with HKI on a program in Bangladesh called “Making Markets Work for Women.” In the first year of the program five villages were selected in the Chittagong Hill Tracts (CHT), one of the poorest regions in the country. Meetings were held with traditional leaders to outline needs and goals, beneficiaries were selected from the poorest members of each community, and seeds were distributed. This second year will emphasize intensive skills-building and technical training of the beneficiaries. This involves training in food production techniques, pest control, and use of organic fertilizers; in nutrition and food storage; and in marketing techniques. The program aims to improve food security for 75 extremely poor indigenous households representing 375 people in five villages. Courtyard sessions focus on gender and nutrition issues relevant to both men and women, including optimal feeding practices for children from birth to two years of age. The project will also establish community marketing groups for women so participants can work together to process and sell their products, thus helping to combat discrimination at local markets. Year two of a three-year project. Moanoghar was founded in 1974 by a group of Buddhist monks to provide shelter to children of the Chittagong Hill Tracts affected by conflict or living in remote areas. Currently more than 1,250 children live at Moanoghar, some 40% of them girls. Many of the children were left homeless or orphaned on account of a decades-long ethnic conflict. All children at Moanoghar receive free or highly subsidized education. BGR is currently sponsoring a three-year project to establish a sustainable educational system that can generate income to maintain the institution and support the children being schooled there. The goals during the second year of the project are: (1) to establish sustainable income to support the institution and the students; and (2) to add nutrition for students with crops like papaya and bananas. To meet these goals, BGR sponsorship will allow the creation of a bamboo plantation on five additional acres of land (beyond the three acres that BGR supported this past year); the planting of various fruit crops; and the hiring of an additional gardener to maintain the gardens. Year two of a three-year project. This entry was posted in Education, Engaged Buddhism, Food security, News item, Projects & programs and tagged Bangladesh, Bhikkhu Bodhi, Children's education, Helen Keller International, Moanoghar, sustainable agriculture. Bookmark the permalink.